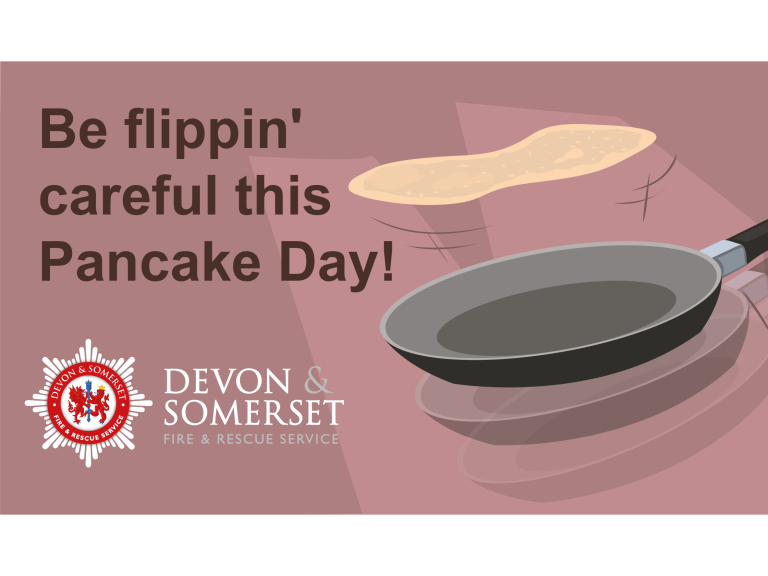 Devon & Somerset Fire & Rescue Service realise that fire safety may not be at the forefront of your mind, when you have the temptation of a tasty pancake, sprinkled with lemon juice and sugar in front of you. But it is important to keep an eye on the pan as well as the pancakes! Never leave any cooking or kitchen appliances unattended. It only takes a few seconds for an unattended pan or cooker to ignite and develop into a serious and life threatening fire. Never put the food in the pan if the oil begins to give off smoke. Keep theoven, hob and grill clean, a build-up of fat and grease can catch fire. Keep tea towels and cloths away from the cooker and hob, take care if you’re wearing loose clothing. Do not leave saucepan handles sticking out to avoid them getting knocked off the stove. Use spark devices to light gas cookers as they are safer than matches and lighters as they don’t have a naked flame. Don’t take any risks. Turn off the heat if it is safe to do so. Never throw water over it. Don’t tackle the fire yourself. Get out, stay out, call 999. A working smoke alarm will greatly increase your chances of escaping unharmed. Have an escape plan and follow it - know exactly which way you will leave the house, and know where you will go. Clean it out properly at least twice every year, by vacuuming the inside.